The Collector of Lives: Giorgio Vasari and the Invention of Art tells to history of how humans have interacted with, created, and thought about art, from pre-history to today. 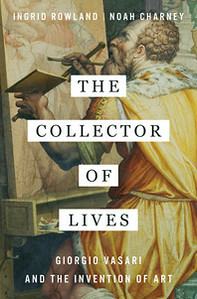 The Collector of Lives: Giorgio Vasari and the Invention of Art tells the history of how humans have interacted with, created, and thought about art, from pre-history to today. It is told through the lens of Giorgio Vasari, the great Mannerist painter, architect, and biographer who is considered the godfather of art history. His multi-volume Lives of the Artists, a group biography of Renaissance artists, first published in 1550, is still the go-to primary source for scholars studying Renaissance art and history. In the vein of The Swerve and How To Live, this book will bring to life 16th century Italy and the history of art history. This book will be co-authored by Noah Charney and Ingrid Rowland. It will be published by Norton in 2017. As you step out of the blinding Florentine sunlight and into the terracotta-scented Palazzo Vecchio, it will take a moment for your eyes to adjust. But when they do, and the Sala dei Cinquecento leaps into clarity, you may be surprised to find yourself surrounded by giants. The soaring walls of this vast meeting hall (12,750 square feet) are painted with larger-than-life-size frescoes of riding and ranting warriors. Four enormous battle scenes show the military triumphs of the Medici family, painted in 1563 by Giorgio Vasari. His soldiers bulge out of skin-tight armor as they assault a fortified city by lamplight. The Mannerist style of painting, with its steroid-popping musculature and neon armor-clad warriors, is not everyone’s cup of tea. Even fellow Mannerists mocked each other: The great sculptor Benvenuto Cellini got it just about right when he said that Baccio Bandinelli’s Hercules looked “like a sack full of melons.” Developed by the followers of Michelangelo in 16th century Florence, with its intentional contortions and refusal to adhere to the laws of physics and anatomy, Mannerist paintings look to many like piles of body-builders in Day Glo spandex engaged in an over-zealous round of Twister. Yet the colossal frescoes that cover the walls of the Sala dei Cinquecento are undoubtedly awe-inspiring, considered masterworks of 16th century painting. They are also intriguing for another reason. Buried beneath one of the four frescoed walls may lie a treasure of far greater importance—one which, should it still exist, has not been seen for five centuries. Beneath Vasari’s fresco could be a lost painting by Leonardo da Vinci, one that tells the tale of a battle between the two greatest painters of Renaissance Italy and hinges on a mystery sparked by another masterwork by Giorgio Vasari, a book titled Lives of Artists. Of the lost Leonardo, the known facts are these. In the 14th century, the Sala dei Cinquecento, with its theatrically tall ceilings, functioned as the reception room used by the Medicis when hosting visiting dignitaries whom they wished to awe. In 1505, during a brief period when the Medici family was expelled from Florence, Leonardo began a monumental wall painting (54 x 21 feet in size) in the sala, called the Battle of Anghiari: a torqued melee of riders and swordsmen. The Medicis also commissioned Michelangelo to paint a second battle scene on the opposite wall of the sala, called Battle of Cascina. Michelangelo made a preparatory sketch, but never executed the fresco, as he felt that Leonardo’s side of the room had better light, and that he would be at a disadvantage in this intentional duel between the two greatest living artists. While Michelangelo never began his side, Leonardo began but did not finish his. Leonardo’s partial Battle of Anghiari is known only by a number of copies, the most famous of which is by Rubens, which was painted around 1604, and which itself must have been made based on a drawing, since the original had been covered over four decades prior, by Vasari. Based on the Rubens copy, it seems that Leonardo painted only a small portion of one wall, but the beauty and dynamism of his embattled warriors made the unfinished work a point of pilgrimage for artists who traveled to Florence. Why did Leonardo give up on what seemed like a promising project? Possibly the abandoned painting was the victim of his genius. The notoriously impatient Leonardo rarely completed anything—he wrote that one of his greatest regrets was that he never once finished a single painting. He was exaggerating, but not by much. According to Leonardo’s own notes, a portentous disaster struck when he was just at the start of painting his battle scene. His diary, dated 6 June 1505, reads: “Just as I lowered the brush, the weather changed for the worse and the bell started to toll…the cartoon was torn, water poured down and…it rained very heavily until nightfall and the day was as night.” Our best guess is that melodramatic weather, as well as Leonardo’s habit of rarely finishing anything he began, both led to his deserting the commission. There are only twenty-two extant paintings by Leonardo, and eight more that are mentioned in archival documents and primary sources but have never been found. Should this unfinished battle scene resurface, it would become the twenty-third. What we know of Leonardo’s life and stories, we have learned largely from Vasari. In 1550, half a century after Leonardo halted production on Battle of Anghiari, Giorgio Vasari wrote The Lives of Artists, a group biography of the leading Renaissance artists, many of whom he knew personally. How did Brunelleschi win the commission to construct Florence’s Duomo by balancing an egg on a slab of marble? What did a teenage Leonardo da Vinci paint that so impressed his master, the great Andrea del Verrocchio, that Verrocchio gave up painting forever, deciding he would do better by sticking to sculpture? Why did the mysterious Giorgione choose to die for love, lying in bed with his sweetheart in order to contract the plague from which she was dying, and what did Masaccio smell like that won him his less-than-flattering nickname? What was the dirty joke, made at the expense of his sister, which caused Titan’s best friend Pietro Aretino to literally die laughing? These are among the funny, poignant, and memorable stories told in Giorgio Vasari’s canonical The Lives of the Most Eminent Painters, Sculptors, and Architects that, for five centuries, has been the standard primary source text used in almost all of the world’s art history courses, from introductory to post-graduate levels. Vasari has been called the “father of art history.” He is credited with being the first author to consider artistic movements, the chain of influence from master to pupil, the link between an artist’s personal biography and beliefs and the art he created in his books. His methodology effectively established the way we study art history today, and cemented the primacy of Florentine Renaissance art in the popular conception of what constitutes the crowning achievement of art history. Since its publication, Vasari’s The Lives of the Artists, has been fundamental to the way we see and study art. Still read by every student of European art history around the world, and still the go-to primary source for scholars of Renaissance art and thought, Lives has had a profound effect on how we analyze and define art. Its influence has been consistent for nearly five centuries. Not only is it a point of departure for all other authors writing on art, the book has also colored how the general public approaches different artists—the idolization of Leonardo, Raphael, and Michelangelo is largely due to Vasari and his effusive praise of them. By exploring who Vasari was, how he wrote his book, and what influence it had on how we perceive art, we can explore the significant questions of what art is, why it is so important to the human species, and how we have interacted with it. Vasari was the 16th century equivalent of a “groupie,” he idolized his peer artists, particularly Michelangelo. As a result, Lives is seen by some as a multi-volume work of propaganda that sets out to convince its readers that Michelangelo was the greatest artist of all time. In addition to the anecdotes that populated his Lives, Vasari also collected drawings avidly, and was instrumental in establishing drawings as a significant art form. Before Vasari proclaimed drawings as great works of art unto themselves, artists viewed them as preparatory material, not fit for display and generally discarded. Michelangelo himself, when he realized in his old age that he was near to death, frantically burned as many of his own drawings as he could, in order to erase evidence of how hard he had worked in preparation for his paintings and sculptures—he wished for posterity to believe that his finished creations came about spontaneously, as a product of his genius, not his diligent preparation. It was only thanks to Vasari’s physical intervention, wresting reams of drawings out of Michelangelo’s hands as he stood before an open fire, that a reasonable number of those drawings survive. A Michelangelo drawing sold for £13 million a few years back, a direct legacy of Vasari’s interventions and influence. Vasari kept several large-format books, called his Libri dei Disegni, which functioned as collectors’ albums, filled with drawings by the artists he admired. These books are unfortunately lost, but they are a testament to his loving admiration of Tuscan artists above all, especially Michelangelo and Leonardo. Vasari’s admiration for these artists would have caused him serious reservations about destroying work by either man, even a painting only partly finished, like Leonardo’s Battle of Anghiari. When he was entrusted with remodeling the Sala dei Cinquecento and painting it with his own frescoes in 1563, Vasari would have done anything he could to preserve Leonardo’s wall painting. The Medici family had been in exile when Leonardo’s Battle was painted. They returned to Florence, and to their Palazzo Vecchio, in 1512 to find the unfinished wall painting by Leonardo. Its presence was a reminder of their temporary exile. Had the Leonardo been completed, it might have been a different story—the Medici were admirers of Leonardo and might, indeed, have allowed it to remain. But an incomplete painting commissioned during their exile was not the sort of thing that they wanted to advertise when they met foreign dignitaries in the Sala dei Cinquecento. Some fifty years after their return to power, the Medici commissioned Giorgio Vasari to repaint the sala with battle scenes of great Medici victories. Vasari fulfilled his commission, and the sala now shines with his frescoed battle scenes. But the question remains: what happened to Leonardo’s Battle of Anghiari?